So what’s really causing the endless cycles of warming and cooling, if it isn’t a constantly changing “Greenhouse Effect” – with man to blame? Man wasn’t producing much CO2 in the past million years, so he hasn’t simply been turning the greenhouse up and down at will. Just look up – one of the most likely culprits is our old friend, the Sun. Canadian climatologist Tim Patterson says the sun drives the earth’s climate changes—and Earth’s current global warming is a direct result of a long, moderate 1,500-year cycle in the sun’s irradiance. Patterson says he learned of the 1,500-year climate cycle while studying cycles in fish numbers on Canada’s West Coast. Since the Canadian West had no long-term written fishery records, Patterson’s research team drilled sediment cores in the deep local fjords to get 5,000-year climate profiles from the mud. The mud showed the past climate conditions: Warm summers left layers thick with one-celled fossils and fish scales. Cold, wet periods showed dark sediments, mostly dirt washed from the surrounding land. Patterson’s fishing profiles clearly revealed the sun’s 87 and 210-year solar cycles—and the longer, 1500-year Dansgaard-Oeschger cycles found since the 1980s in ice cores, tree rings, and fossil pollen. “Even though the sun is brighter now than at any time in the past 8,000 years, the increase in direct solar input is not calculated to be sufficient to cause the past century’s modest warming on its own. There had to be an amplifier of some sort for the sun to be a primary driver of climate changes. Indeed, that is precisely what has been discovered,” says Patterson. The Canadian expert concludes, “CO2 variations show little correlation with our planet’s climate on long, medium and even short time scales. Instead, Earth’s sea surface temperatures show a massive 95 percent lagged correlation with the sunspot index.” We’ll talk about what a “correlation” means in a couple of minutes. So what does this all mean? 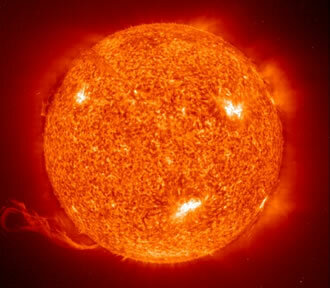 It means, in the simplest of terms, that it is the Sun which is warming the oceans, not an increased “Greenhouse Effect” caused by human activity. And, it might appear that Mother Earth is not the only one suffering from the Sun’s effect. Data from NASA’s Mars Global Surveyor and Odyssey mission in 2005 disclosed that the carbon dioxide “ice caps” near Mars’ south pole had been shrinking for three consecutive summers. Mmmm… We could go on for endless pages on solar science and the sun’s relationship to global warming, but we’re not going to do that. One of the best summary articles we’ve found in simple layman terms is by Kevin Roeten, and you can read more on that by clicking HERE. The current warming Solar Cycle is just about over. The global temperatures have been nominally flat for the past 8 years. If the Solar Scientists are correct, we about to head into a cooling cycle… which is not good news.